Entire female cats must not roam free unless under supervision. Calling females must be confined. Entire male cats must never roam free. Must be groomed regularly and handled daily. Must be given facilities for climbing and scratching. Be given a balanced and varied diet. Be housed in hygienic conditions. Be provided with hygienic toilet facilities which are kept clean and disinfected regularly. Food and water bowls to be changed at least once a day. Receive prompt veterinary attention if and when required. Be vaccinated in accordance with current veterinary advice. Be treated on a regular basis for internal and external parasites, in accordance with current veterinary advice on various parasitic cycle controls. Crossbreeding is not permitted unless the breeder has an experimental license, or where it is generally accepted otherwise, e.g. British Shorthair X Scottish Fold. Cats should be fed a varied diet except on veterinary advice. Kidney, heart, raw liver – NOT MORE THAN ONCE WEEKLY. Cooked and boned fish, chicken, rabbit. Cheese, cottage cheese, egg yolk. FRESH WATER MUST ALWAYS BE AVAILABLE. ADULT CATS SHOULD BE OFFERED FOOD TWICE A DAY. Must be partially covered to provide a sheltered sleeping area. Units must be designed and maintained to avoid injury and/or escape. The structure to be non-porous or coated with non-toxic materials to facilitate easy cleaning. Cleaning and disinfecting agents should be used only in recommended concentrations. Where a disinfectant solution has been applied, the area should be allowed to dry before the animal is allowed to return, as some solutions can be absorbed through the skin/paw pads. PHENOLS must not be used. Minimum cage size for a single cat confined at night-time only, or for no longer than Eight (8) hours = 1200mm long x 400mm wide x 600mm high. Minimum permanent unit size for a single adult cat = 1600mm long x 1600mm wide x 1950mm high, or an equivalent area. Minimum permanent unit for two to four (2-4) cats = 3600mm long x 2400mm wide x 1950mm high. No more than four (4) cats to be housed on a permanent basis in a unit this size, as cats are territorial, and over-crowding causes undue stress. Animals housed in units within homes, garages etc, must have access to sunshine, and such areas must be well ventilated at all times. Where cats are permanently confined to units, provide adequate scratching posts and High-level shelving for exercise. (See also section for Stud quarters). Queens shall not be overbred, Maximum of two (2) litters per every 12 months is recommended. Breeders shall keep records of all matings, including mating dates, birth dates, number and sexes of kittens born. All breeders are to familiarise themselves with the kittening process prior to breeding a Litter. Increase food amounts to the queen as pregnancy progresses and/or as the queen requires. Ensure an adequate calcium supply during pregancy and lactation. Provide a clean, adequately sized box and bedding at least one (1) week prior to expected kittening. Assist the kittening process where necessary. Queens must not be left more than two (2) hours in unproductive labour before seeking veterinary advice. Once all kittens are born, replace bedding and/or box, and change bedding at least every two (2) days. Queen and kittens to be kept in a draught free, but well-ventilated area. Check the queen daily for undue bleeding and signs of mastitis. Check kittens daily for weight gain. 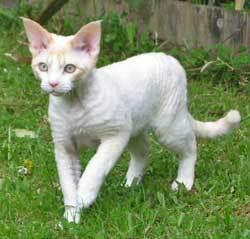 Seek veterinary advice on sickly or deformed kittens. Eyes should be checked daily in small kittens and if eye infections occur, veterinary treatment should be sought. Kittens shall not be taken away from their mother until such time as they are fully weaned. Between 4 and 6 weeks, kittens may be introduced to suitable foods, e.g. Cereal, Baby food (chicken, fish, beef broth), Specially prepared, commercial kitten food. Between 6 and 12 weeks, kittens may be introduced to:- Finely chopped or minced meat, chicken, rabbit, Grated cheese, cottage cheese, egg yolk, Tinned food. WATER MUST ALWAYS BE AVAILABLE. Provide litter trays suitable for kittens (shallow) as soon as kittens are mobile. Kittens should be fed a minimum of three (3) times daily until 3-4 months of age, when they may be fed twice daily. Kittens quarters shall be safe, to avoid injury from falling. Kittens shall be vaccinated in accordance with the current veterinary advice. Kittens must be treated on a regular basis for internal and external parasites, in accordance with current veterinary advice on various parasitic cycle controls. It is a QFA requirement that all kittens must have undergone a full veterinary examination prior to sale. All new owners must be provided with either a vaccination certificate or health certificate from a qualified veterinary surgeon. No kitten may be sold under the age of 10 weeks of age. Kittens under 12 weeks cannot be fully vaccinated, and it is the breeder's responsibility to ensure that the new owners are provided with current vaccination records and fully informed of the requirements. Kittens shall be healthy, fully weaned and litter tray trained. No kitten with an infectious disease shall be sold or placed. Breeder shall provide purchasers with diet, grooming and care information. Pedigree may be supplied but in case of PET ONLY, same may be with-held until proof of desexing is supplied to the breeder's satisfaction. It is not recommended that kittens be sold to commercial cat wholesalers, or retail pet dealers and may NOT be auctioned, given as a prize or donation for a contest of any kind, or be advertised as a giveaway. 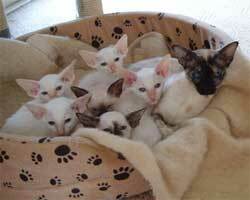 A breeder shall not misrepresent the characteristics of the breed, nor falsely advertise or mislead any person regarding the pedigree or performance of any kitten on the show bench or as a pet. Kittens sold as breeding stock shall be sold ONLY to REGISTERED BREEDERS. Pet kittens shall be desexed by six (6) months of age. It should be the breeders responsibility to ensure that the purchaser is made aware of any current law in this regard. Breeders shall keep records of names and addresses of all purchasers. Quarters must be as roomy as possible with the minimum size being 2100mm x 1950mm with an area set aside within the enclosure for the introduction of visiting queens. Climbing and scratching facilities must be provided, plus a high shelf for the stud to retreat to after mating. Studs require plenty of companionship both human and feline. On a daily basis, some time should be spent grooming and handling the stud. A feline companion such as a desexed cat may be beneficial. Each stud must have individual quarters. Current vaccination certificate must be sighted before accepting a visiting queen. Visiting queens should be examined for cleanliness and state of health prior to introducing to stud. Matings shall only be accepted for cats owned by registered breeders. Queens should be permitted to remain with the stud for a reasonable time after mating, and not be removed from the stud quarters before a minimum of three (3) matings have been witnessed. It is the breeder's responsibility to desex all stock no longer required or unsuitable for Breeding. Desexed former breeding stock may be found homes. Creating overcrowding within the cattery should be avoided. No breeding cat shall be excessively passed around, be leased loaned or sold ENTIRE more than three (3) times during its life, before being desexed. It is the owner's responsibility to ascertain the acceptability of the new owner's (lessee's borrower's, buyer's) premises and standard of care before the cat is re-located. All ex-breeding stock must be microchipped prior to sale or re-homing. NO PERSON MAY ADVERTISE A CATTERY SELL-OUT. All breeders must be registered annually with an approved governing cat control body. All QFA breeders are strongly encouraged to enter shows regularly or as a minimum once in each calendar year. This ensures that breeding programmes conform as close as possible to the ACF breed standards.